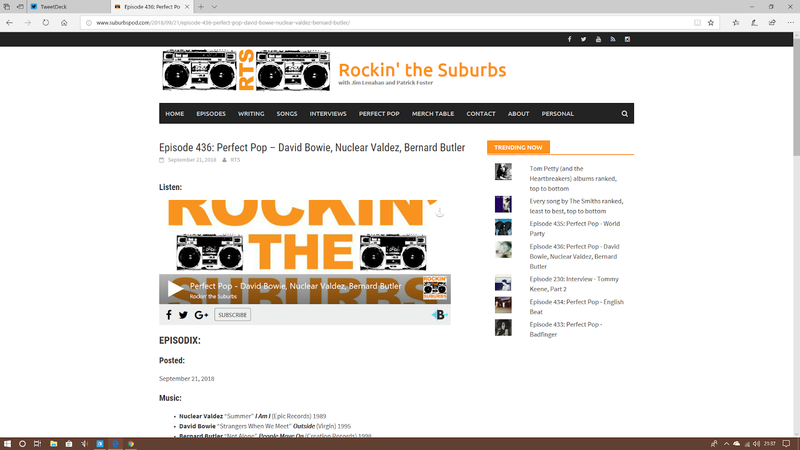 Just a short post today to mention that my voice, and ramblings, feature in today's episode of the superb Rockin' The Suburbs podcast. If you've never checked it out, I highly recommend you do. Jim & Patrick put out five shows a week, and I've discovered some great new music through their show. Over The Rhine and Jason Isbell to name but two. It's one of the best music podcasts out there. I talk about Nuclear Valdez's "Summer", David Bowie's "Strangers When We Meet" and Bernard Butler's "Not Alone". As well as Teenage Fanclub of course! The great version of "Let's Dance" can be found here.